Poplar trees are fast-growing, deciduous trees. There are more than 30 species of populus plants worldwide, with many more hybrids. Poplars range widely in appearance, with some plants looking more like short shrubs, and others that grow as towering trees. In America, many poplars are known as cottonwoods or aspen trees. There are many uses for this popular tree, both in the home garden and commercially. Many homeowners choose to use poplar trees as shade trees, simply because of their fast growth. The Lombardy poplar in particular is often used for this, but it is not recommended for planting due to its proclivity for disease, according to master gardeners with the University of Florida. Instead, white poplars are recommended for use as shade trees. The Simon hybrid of white poplar reaches a manageable height of 40 feet. Poplars are a popular choice for use as a privacy screen, fence line tree or windbreak. While these fast-growing trees can quickly hide an ugly fence or create a barrier, it is again important that the correct species be chosen. Hybrid poplars bred for their resistance to diseases are often used in this manner. Hybrid poplars are grown commercially for many reasons. There is an increasing demand for hybrid poplar chips, which is a great source of fuel for pellet stoves and is also often used as mulch. The soft wood is also used in paper production, including cardboard, pressed board and paper pulp. 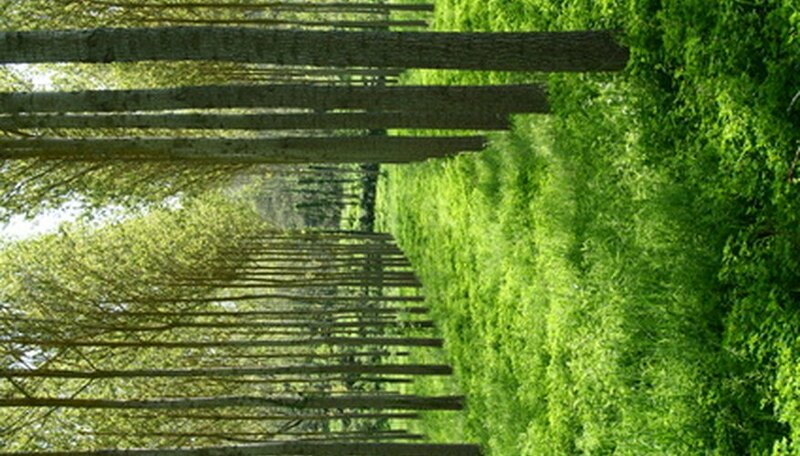 Poplar trees are of great value in the environment. They thrive in very wet soil and are often planted to clean contaminated groundwater, both at water treatment sites and along streams and rivers. They can also be planted along streams and rivers that need restoration. Poplar trees are also used to control erosion and have even been planted to create a wildlife habitat.